Today's recipe for spinach salad with pomegranate and granola bar crumble is a sensory experience! Fresh spinach mixed with pomegranate, apple chicken sausage, pecans, creamy goat cheese and granola bar crumble topped with a curry vinaigrette will be sure to please your palate. This is no ordinary salad! I love salads. I eat them almost every single day for lunch. Since our digestive capacity peaks around noon, this is when I find I tolerate cold and raw foods best. I LOVE making salads unique and entertaining to eat. This salad is one of my favorite salad creations to date. You just cannot beat the flavors and textures going on in it! Fresh spinach leaves, poppy pomegranate arils, sauteed apple chicken sausage, nutty pecans, creamy goat cheese....AND a granola bar crumble! Nick and I both agreed, the crumble is the best part of the salad. And then you top all of that goodness with curry vinaigrette and y'all...this foodie is in HEAVEN. I made the granola bar crumble with a Madagascar vanilla almond & honey bar from This Bar Saves Lives. Simply chop the bar into small little nuggets (I just love the word nugget) and serve on top of the salad. The bar adds a nice sweetness to the salad and a crunch that cannot be beat! This Bar Saves Lives reached out to me recently to try their new bars and I happily agreed! I was of course impressed with the 4 different flavors they have, but I was even more impressed with the product guarantees. The bars are non-GMO certified (very important to me) as well as gluten free, Fair Trade certified, kosher and even bee friendly! But y'all, get this...for EVERY SINGLE BAR sold they donate to a child in need. For each bar sold, their non-profit partner makes a packet of life-saving food to give to a child in need. To date, they have donated over 1.5 million packets, which is enough to help save over 10,000 lives. It literally gives me goose bumps to think of how extraordinary that is. First, make the dressing. Combine all the ingredients in a mason jar, close the lid and shake to combine. Set aside. Heat a small saute pan on medium high heat. Place the sliced apple chicken sausage in the pan and saute for 5 minutes, stirring occasionally. The sausage is done with it is slightly brown on both sides. 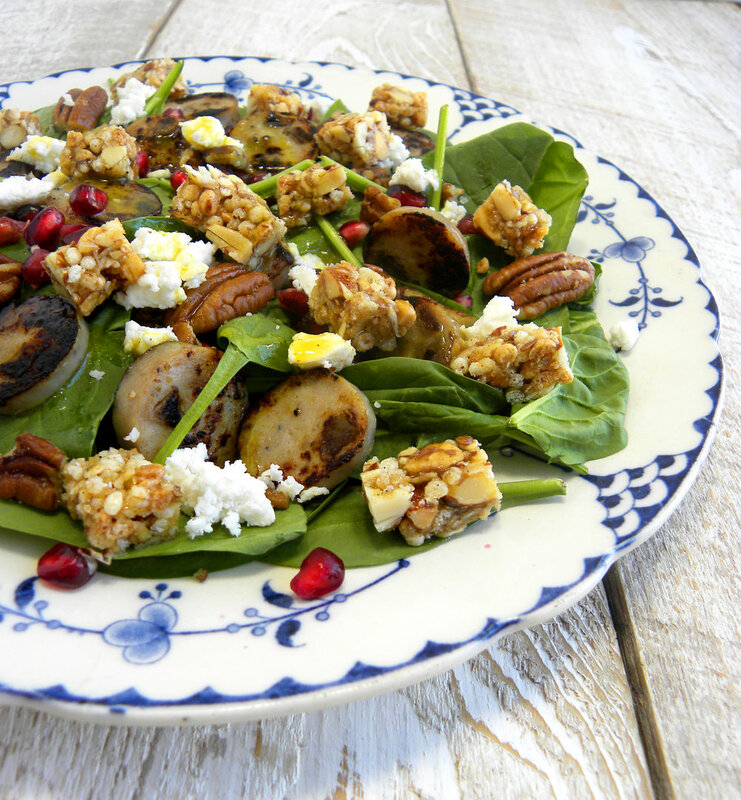 While the sausage is cooking, place the spinach, pomegranate arils, goat cheese and pecans in a bowl. When the sausage is finished, place on top of the salad. Top with the salad dressing and enjoy! Salad dressing will make more than what you need for this salad. [br]Recipe can easily be doubled or quadrupled to make lunch for the week! I hope you make today's salad and enjoy the flavor amazing-ness of it. But I really, truly hope that you go find yourself a This Bar Saves Lives bar at one of the select Whole Foods, Target or Starbucks that is selling the bars or online. Enjoy the bar but also know that you made a difference to fight malnutrition world wide. This post is sponsored by This Bar Saves Lives. Thanks for supporting the brands that make Diehard Foodie possible!